If you've been checking out different apartments lately, you may have noticed that some apartment communities have a pet policy that states "breed restrictions apply." What do breed restrictions really mean, and why do they exist? Understanding different apartments' pet policies is the first step to finding a great fit for you and your dog. 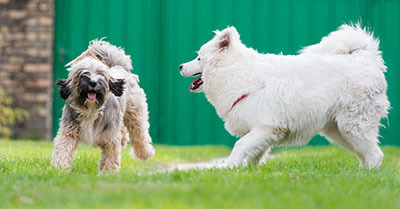 Here's what you need to know about dog breed restrictions to aid you in your apartment search. An extra word of warning, in a college town like Tallahassee you'll want to pay extra attention to pet policies at apartments near FSU, TCC, and FAMU. Many student housing communities have extra rules in place regarding pets. For example, you'll want to make sure you let the leasing team know that you have a pet well in advance so that you can be roommate matched with individuals who have indicated that they do not have pet allergies. The most important thing you should know is that breed restrictions only apply to dogs. Breed restrictions limit which breed of dog renters are allowed to own while living in their apartment. These restrictions are independent of body weight, which some apartments limit as well. Some breeds are thought to be more likely to cause damage or physical harm because of their size and history of aggression. These breeds may be placed on a community's restriction list. If your dog is on an apartment's restriction list, the community will not allow you to sign a lease. Even if your dog is a mix of multiple breeds, it may still land on an apartment's restriction list. Individual communities do not come up with restriction lists themselves, and cannot negotiate their breed restrictions. You may know your dog to be gentle and harmless, but insurance companies evaluate risks using the actuarial and claims data (frequency and number of bites, attacks, etc.) they've gathered over the years to determine which dog breeds are "high risk." If thousands of people in the United States file claims about dog bites and attacks for a certain breed, that breed is likely to wind up on insurance company's restriction list. Insurance companies recommend their list and apartment communities working with that insurance company adopt that list into their pet policy. However, some apartments chose not to restrict breeds at all. Some of the most common breeds to appear on lists are Pit Bull Terriers, Doberman Pinschers, Rottweilers, German Shepherds, Mastiffs, Great Danes, Siberian Huskies, Alaskan Malamutes, and wolf-hybrids. Breeds that are mixes of the restricted breeds (like pit bull mixes or lab and husky mixes) may also be included on the list. There's a ton of variability among breed lists. Different insurance companies recommend their to the apartment communities they're working with. How Can I Find Out Which Breeds an Apartment Restricts? If you want to bring your dog with you when you move or are interested in adopting a dog, check with the apartments you're interested in about their pet policy. Send the community an email, or give them a call to learn more. While your Pomeranian may be on one community's list, other apartments may have much different lists. Now that you understand more about how breed restriction lists work and why they exist, you should have the knowledge you need to find the best apartment for you and your furry friend. Happy apartment hunting!